Sequences of eclipses lead Bible teachers to believe that such events are not simply coincidences of nature. Psalm 19:1-4 The heavens declare the glory of God, the dome of the sky speaks the work of his hands. Every day it utters speech, every night it reveals knowledge. Without speech, without a word, without their voices being heard, their line goes out through all the earth and their words to the end of the world. Joel 2:31 (3:4) The sun will be turned into darkness and the moon into blood before the coming of the great and terrible Day of Adonai." Acts 2:20 The sun will become dark and the moon blood before the great and fearful Day of Adonai comes. Revelation 6:12 Then I watched as he broke the sixth seal, and there was a great earthquake, the sun turned black as sackcloth worn in mourning, and the full moon became blood-red. Matthew 24:29 "But immediately following the trouble of those times, the sun will grow dark, the moon will stop shining, the stars will fall from the sky, and the powers in heaven will be shaken. "Then the sign of the Son of Man will appear in the sky, all the tribes of the Land will mourn, and they will see the Son of Man coming on the clouds of heaven with tremendous power and glory. Why are we not aware of signs in the sky? So why is it suddenly good to be dark? The Northumberland dark skies initiative started with an effort by county councils, businesses and residents to do something about light pollution. This wasn't just a case of switching off, but was about using technology to use light more efficiently. If you live in London or Bristol or Oxford go out on the next clear night and count how many stars you see. Londoners haven't seen the Milky Way since the Blitz forced the city into blackout. But when the lights go off, the stars come out. I once drove a pea combine from eight at night until eight in the morning in one of the darkest places in America. I couldn't believe the light show that was put on for my benefit every night. Meteors were a mundane occurrence, but no less exciting for being so. 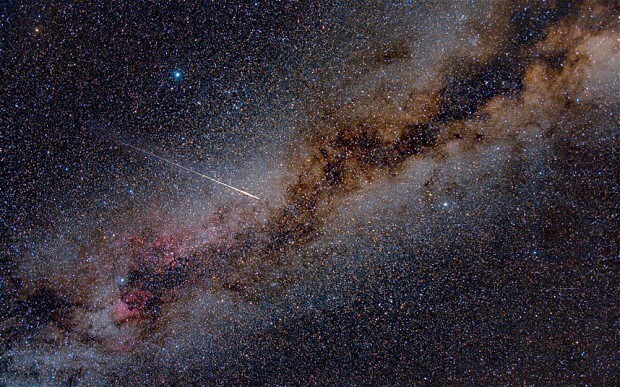 The Milky Way was a bright band of billions of stars all competing for prominence. The dark sky once made cavemen gaze upward and made Galileo speculate on celestial motion. We've lost that sky, and the imagination that goes with it. The firmament is no longer a thing of wonder for the simple reason that we can't actually see it. Light may be synonymous with understanding, but only in darkness can we appreciate the vast magnificence of the universe. Turn on the lights and our world shrinks. Signs in the heavens were watched by the Magi of the Christmas story. After Yeshua was born in Beit-Lechem in the land of Y'hudah during the time when Herod was king, Magi from the east came to Yerushalayim. and asked, "Where is the newborn King of the Jews? For we saw his star in the east and have come to worship him." There weren't (necessarily) three of them, and we do not know their names. They were unlikely to be astrologers of the type who write horoscopes and suchlike mumbo-jumbo. According to Wikipedia - Magi ( singular magus ) denotes followers of Zoroastrianism or Zoroaster. The earliest known use of the word Magi is in the trilingual inscription written by Darius the Great, known as the Behistun Inscription. Old Persian texts, pre-dating the Hellenistic period, refer to a Magus as a Zurvanic, and presumably Zoroastrian, priest. In Strong's dictionary, the Greek word is magos - mag'-os, meaning "of foreign origin [H7248]; a Magian, that is, Oriental scientist; by implication a magician: - sorcerer, wise man." So the Priests and Sages and magicians were lumped together under this label, and it appears most were Zoroastrians, but the Hebrews faithful to YHVH rose to be included. Daniel and other smart and god fearing hebrews were taken to exile by the Babylonians, where they rose into the King's circle of advisers - that also included magicians etc. Daniel 1:17 , and " Dani'el remained there until the first year of King Koresh." Daniel's three companions were set up but proved themselves faithful - Daniel 3:30 "Then the king gave Shadrakh, Meishakh and `Aved-N'go higher rank in the province of Bavel." Daniel 5:15 Daniel interpreted the king's dream and - Daniel 5:29 "Then Belshatzar gave the order; and they clothed Dani'el in royal purple, put a gold chain around his neck and proclaimed of him that he was to be one of the three men ruling the kingdom." Daniel 6:29 "So this Dani'el prospered during the reign of Daryavesh, and also during the reign of Koresh the Persian." Outside the Daniel story, we know that the Jewish sages, rabbis etc were studying and writing, producing works such as the Babylonian Talmud. Not all the exiles went home after the seventy years, and the Jewish community in "the East" continued to study the scriptures and what they promised about the coming of Messiah. "I see him, but not now; I behold him, but not soon - a star will step forth from Ya`akov, a scepter will arise from Isra'el, to crush the corners of Mo'av and destroy all descendants of Shet." "Two happened right in a row at the time of destruction of the temple in 70 A.D. and on feast days," Biltz told WND. "Around eight months before the Temple was destroyed we find on 10/18/69 there was a partial lunar eclipse on the Feast of Sukkot. A total solar eclipse followed this on Nisan 1-3/30/70, the beginning of the religious year. Two weeks later there was a penumbral lunar eclipse on Passover on 4/14/70. An annular solar eclipse followed this on Rosh Hashanah on 9/23/70. Then another penumbral lunar eclipse on Sukkot on 10/8/70," Biltz continued. "This would be totally unbelievable, if it wasn't verified by the NASA. But that's not all. Then there was another partial lunar eclipse on Purim the following year on 3/4/71," Biltz said. Biltz said the pattern of eclipses continued to occur on Jewish Holy Days for the next year and, in his opinion, corresponded with significant events in Jewish history. 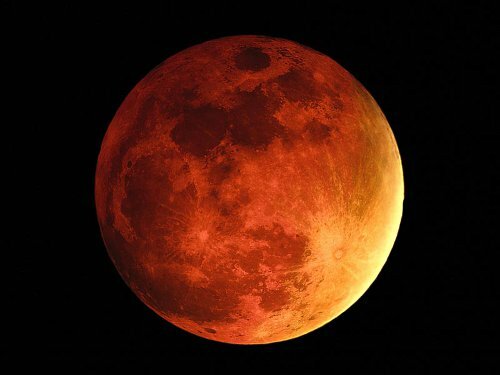 Such events have occurred at other times in recent centuries, and each time they were linked to significant events for the Jewish nation, claims John Hagee's book, "Four Blood Moons: Something is About to Change." 26/03/16 - Planet X flyby - tends to cause catastrophes, like Noah's flood. Lunar eclipses occur when the Sun, Earth and Moon are aligned and the Moon passes into the Earth's shadow, which can only ever happen on the night of a Full Moon. There are at least two each year, and over a quarter of them are total eclipses. Unlike solar eclipses, which can only be observed from a relatively small area of the world and last a few minutes, lunar eclipses can be seen anywhere on the night side of the Earth (assuming it's not cloudy!) and last for several hours. If the Earth had no atmosphere, its shadow on the Moon would be completely dark. However in reality it is usually visible due to the light from the Sun being refracted through the Earth's atmosphere. Depending on the amount of dust and clouds in the atmosphere at the time, it can appear dark grey, brown, red, orange, or any shade in-between. 5. No feast tetrad occurred at the destruction of Jerusalem in 587 BC, at the birth or crucifixion of Jesus (whichever date you take), at the fall of Jerusalem in 70 AD, during the Yom Kippur War in 1973, or during the Holocaust. For a complete catalogue of lunar eclipses since 2000 BC, including tetrads, see http://eclipse.gsfc.nasa.gov/LEcat5/LEcatalog.html. Although we know from the Bible that the Lord does sometimes use signs in the heavens to herald certain events, we should be careful about accepting such claims without proper investigation. We know that the Enemy works to inspire false prophecies, predictions and claims so as to engender cynicism, apathy and gullibility amongst the faithful, as well as make Christianity look foolish in the eyes of the World. We are thus called to test all things, to discern truth from error, to hold fast to what is good, and to not be carried about with every wind of teaching. In short, we should look for the signs of His return but not be fooled (or jaded) by the false ones! The moon can exactly obscure the sun and the earth can exactly cast its shadow on the moon. But refraction of sunlight in Earth's atmosphere bends red light inwards to illuminate the moon while all other colours miss the moon. If God created these things so precisely, He must have a purpose in them. * it is the tail that counts, not the track, and the tail points away from the sun - not along the comet's path. ISON, a "virgin" comet on its first plunge from the Ort Cloud, may have survived its Dec. 1 swing around the backside of the sun at a minuscule (in astronomical terms) distance of 1 million miles. ISON consists primarily of ice, which enhances its brightness but makes it more fragile. Astronomers predicted that ISON might break up due to the gravitational forces from its close encounter with the sun. ISON did not reappear on telescopes searching for it, so on Dec. 12, the European Space Agency declared ISON's death. On Dec. 13, that death decree was retracted as "something" was then seen leaving a tail behind it heading toward Earth from the sun. But it was merely a portion of its former self. Comet ISON was first identified in September 2012 by a Russian research team working for the International Scientific Optical Network (ISON), whose job was to search for objects in near-Earth space which may pose a threat. ISON was hard to detect because its trajectory was almost straight in toward Earth, with very little lateral motion to show up on telescope film. ISON was six astronomical units (AU) away when it was first detected., a bit farther out than Jupiter's orbit. One AU is the average distance from Earth to the Sun. ISON has been sneaking in toward Earth from behind the planet Mars, making it difficult to spot, even with a telescope. On Oct. 31, ISON crossed Mars orbit, 40 million miles from the red planet, to appear far enough ahead of Mars to be distinguished as a separate object. ISON crossed Earth orbit on Nov. 1, and looped around the Sun by Nov. 30 to start its travel back toward Earth. If the Sun's gravity does not cause ISON to break up ISON will pass 48.8-million miles behind Earth in its orbit on Dec. 15 on its way back to the Ort Cloud. Astronomers say what makes a comet so spectacular, is its brightness and its tail. A large percentage of the comet's mass is ice, frozen to near absolute zero out in the Ort Cloud (an area one light-year across), where trillions of comets rest until disturbed, causing their plunge toward the Sun. Haleys Comet has been observed making its visit every 76 years, last appearing in 1986. ISON will pass 730,000 miles from the surface of the Sun, when the surface of ISON will soar to 3,600 degrees F. A lot of ice will evaporate, and dust will be emitted to form the comet's tail. The comet's tail will be pushed away from the Sun by solar winds. So - Ison did not live up to NASA's expectations, but since it appeared unexpectedly from the Ort cloud, might not another - brighter - comet appear in the same way, as a sign for all to see? However, it was only visible with binoculars (at its brightest) before Channukah and was though to have broken up at perihelion. However ... some of it may have survived its close encounter with the Sun. It was first reported that the Comet Ison's nucleus and tail had been destroyed by the Sun's radiation and tidal forces but the European Space Agency (ESA) said the "story continues". The latest pictures appear to show a brightening of a chunk of the comet which has caused a surge in excitement among skygazers.It is hard to know what has happened but experts say dust and gas are being released and the tail may be growing back. Comet Ison, which had been hurtling through space at speeds of 845,000mph, was due to pass within 730,000 miles of the surface of the sun to be met with temperatures of about 2,700C (4,892F) and an intense gravitational pull as it prepared for its solar slingshot. Officially known as Comet C/2012 S1, Ison had been given a 30% chance of survival by Carey Lisse, of the US Johns Hopkins Applied Physics Laboratory. Comets are frozen balls of space dust left over from the formation of stars and planets. The comet was discovered last year by two amateur astronomers using Russia's International Scientific Optical Network, or Ison. Noting the importance of the timing of the Blood Moons - on The Moedim (God's Appointed Times - a study of the Moedim is suggested. The author is not aware of any clue what this sign might be, but it will be obvious once it does appear. It is not necessary to understand each sign in advance. Somebody asked the preacher Charles Spurgeon, "Can you explain the Seven Trumpets of the Book of Revelation?" "No," he said, "but I can blow one in your ear and warn you to escape from the wrath to come!"